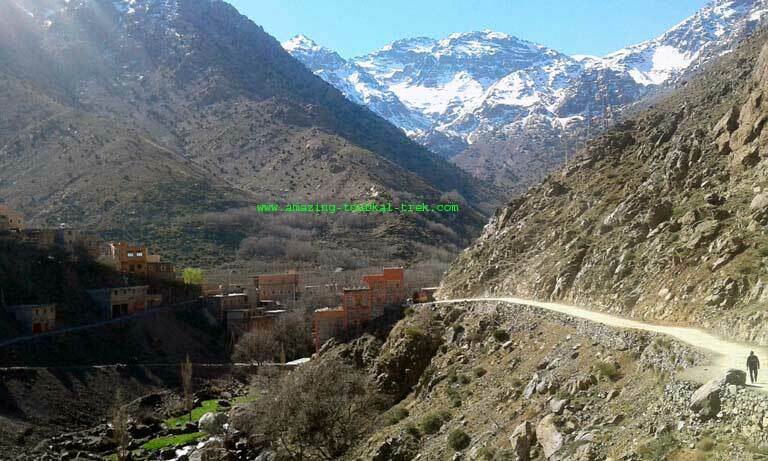 High Atlas trekking: A challenging 6-day hiking Tour to explore the Atlas mountain and ascent Mount Toubkal from Marrakech. The high Atlas trekking allows you to enjoy the spectacular views of different peaks and suitable high passes. You will spend time with natives of Berber villages while exploring their culture, history, and way of living. Accommodation: Guesthouse and Neltner hut or tents. – Enjoy the breathtaking views of the plains and Atlas mountains. – Experience breathtaking views of the high Atlas and valleys. 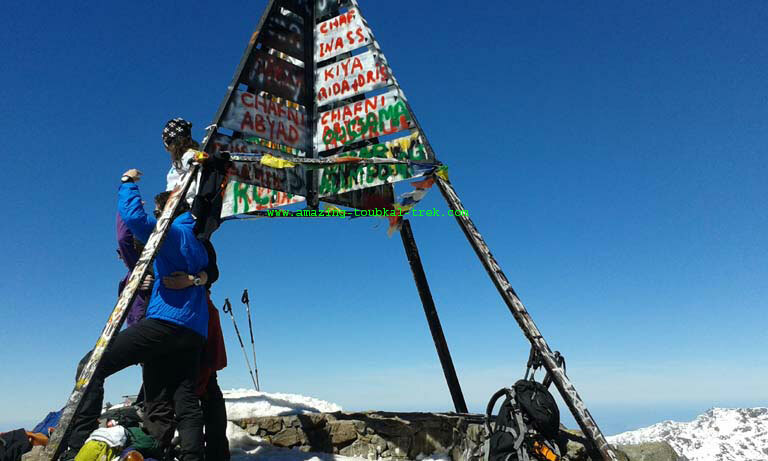 – Trek to the summit of Mount Toubkal, the highest peak in Northern Africa. We head up the valley to enjoy spectacular views of remote shepherd homesteads. We arrive at the top of the valley and enjoy the views of the Cascades d’lrhoulidene. After we head part way down to the valley and ascend steadily to another mountain pass, Tizih’Mzik which is 2,489 meters high. From there we enjoy superb views. We then descend towards another village called Imlil, with views across to Mount Jebel Oukiemaden and surrounding peaks. We reach Imlil and spend the night in the town. The duration of the trek is 5 hours. We start the day by trekking from Imlil and crossing the valley floor, then ascend the valley side. We arrive at Sidi Chamharouch for the 11’s traditional Berber Whiskey, then walk up along a hanging valley. After some hours we catch a glimpse of our target, which is the Neltner Mountain Refuge. Overnight in the mountain hut. 5 1/2 hours of trekking. Early morning we set off to climb Toubkal, starting with a gentle walk up to the valley head to Toubkal pass. At the summit, we will enjoy an exceptional view of the Toubkal Massif, before head back to the base camp. From the Refuge trek back down through Sidi Chamharouch to Around. Overnight in a local guesthouse. 8 hours trek. Leaving Armed village after breakfast, and walk down to Imlil. We then trek along the valley through juniper trees to get over Tizi n Tamatart pass. After enjoying a panoramic view of the mountain peaks, we descend to Imnane valley. Overnight in Gite at Tinerhourhine village. 5 hours of trekking. After breakfast, we follow Imnane valley path down and passing through several villages, Ikkis, Amssakrou, and Imsker. We then trek over a small pass Tizi n’lbour to Imi Oughlad. After a delicious lunch, we go back to Marrakech. A good night rest in the Hotel. 6 hours trek. End of high Atlas trekking. – This high Atlas trekking is available and can be arranged for groups of all sizes. 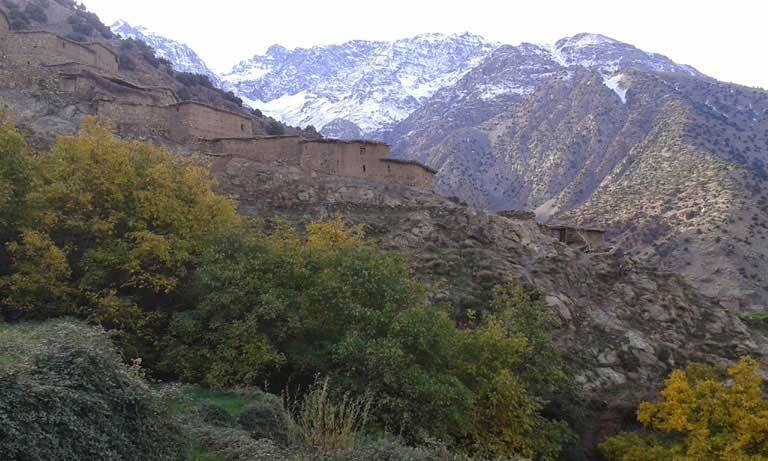 High Atlas trekking allows you to visit Berber villages and attempt on the summit of Mount Toubkal. 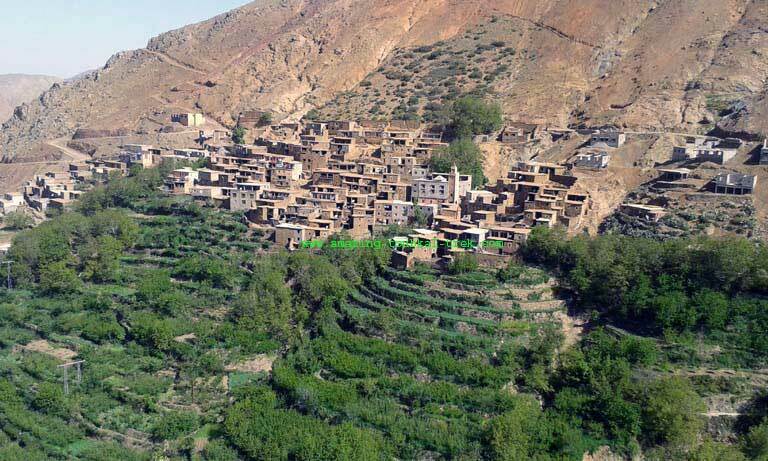 Morocco High Atlas Trekking, Hiking Tour in the Atlas Mountains.